Three thrilling titles from one of America's most popular bestselling authors, together in a special value collection. The Firm - When Mitch McDeere, an ambitious law student from Harvard chooses the Memphis tax firm of Bendini, Lambert & Locke, he finds himself caught between the FBI, who wants an informant inside the firm, and the firm itself, which will make him a very rich man-or a very dead one. The Client - This is the story of eleven-year-old Mark Sway, who witnessed the bizarre suicide of a New Orleans attorney. Just before he dies, the lawyer tells Mark a deadly secret concerning the recent murder of a Louisiana senator whose accused killer, Mafia thug Barry Muldanno, is about to go to trial. All very interesting stories with vivid twists, my favorite was The Client! All three were great stories! 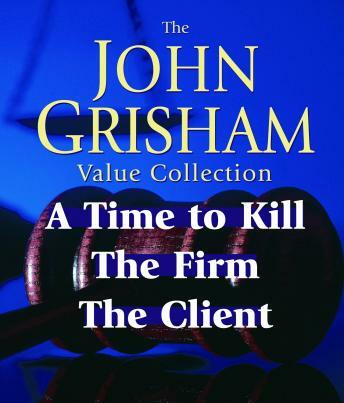 Great way to really get your John Grisham fix in. Keep me in a mother world could not stop listing, great book.